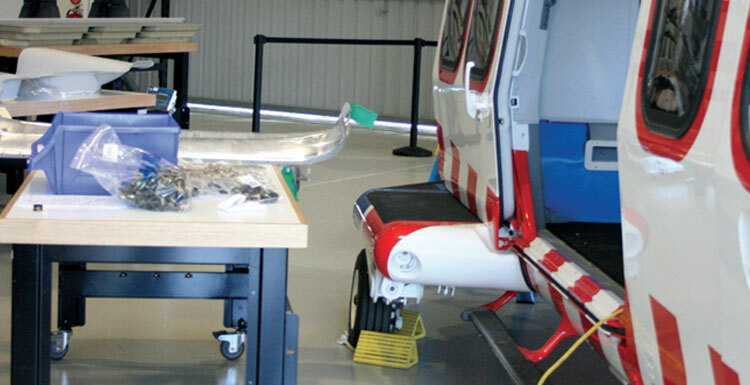 HeliMods provides helicopter operators with a unique range of engineering services. They cover all aspects of the helicopter customisation process from simple equipment mounts through to managing operational fleet configurations. The HeliMods product line is highly regarded by industry and operators alike. They chose OFS Group as their preferred partner to refurbish their workshop and storage areas. With an emphasis on high quality solutions in significantly reduced time frames, HeliMods required workshop and storage solutions to support that vision. Boscotek reseller OFS Group set about designing and delivering a solution that would improve efficiency and productivity. To provide storage and workshop solutions for a refurbishment project, supporting the client’s vision of engineering high quality solutions in significantly reduced time frames. HeliMods worked with OFS Group, Boscotek’s Queensland reseller. The OFS Group have been servicing the Queensland business sector since 1977, offering advice and design consultancy. OFS Group pride themselves on providing impartial advice to clients and can select from an array of suppliers when working with customers on a project. For the HeliMods refurbishment, OFS Group opted for Boscotek, believing it to offer the most versatile, durable and cost effective solution. Boscotek high density storage systems are developed by Wilson & Gilkes who are a Quality Accredited (ISO 9001:2000) manufacturer located in Liverpool, South Western Sydney. Their storage solutions are constructed within a strict set of standards, procedures and protocols throughout every stage of production to ensure delivery of reliable, safe, quality product. Boscotek Industrial Workbenches with Formica surfaces. Boscotek industrial workbenches are designed to support high loads and accommodate heavy-duty applications. 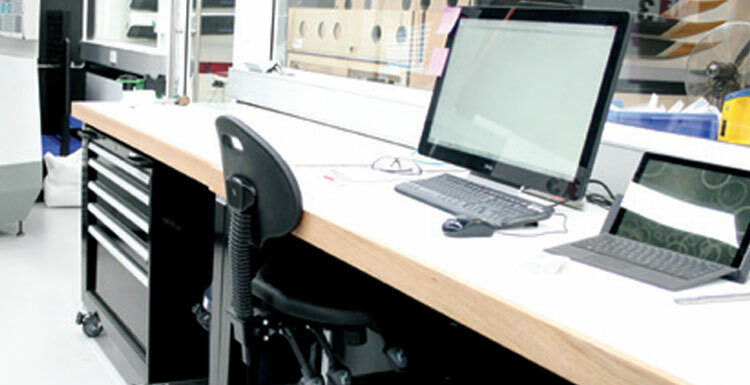 With a wide range of flexible accessory options, these workbenches could be customised to HeliMods’ exact requirements to increase efficiency. Height adjustable legs and shelving units also ensured that the workstations met the ergonomic requirements of each individual. 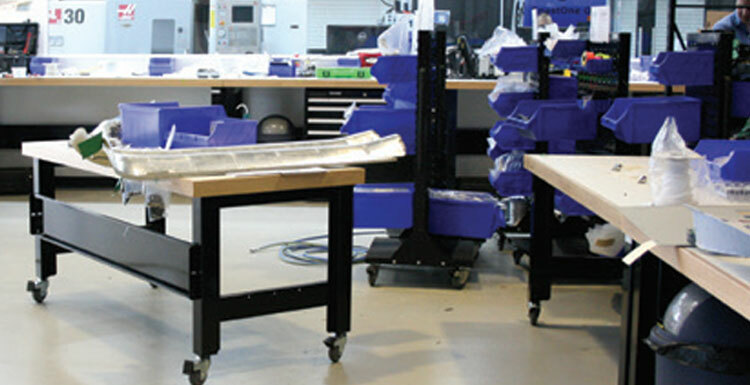 OFS Group worked with HeliMods to combine the workbenches with the following storage solutions. Cabinets Boscotek high density storage cabinets were configured to meet HeliMods specific workplace needs. 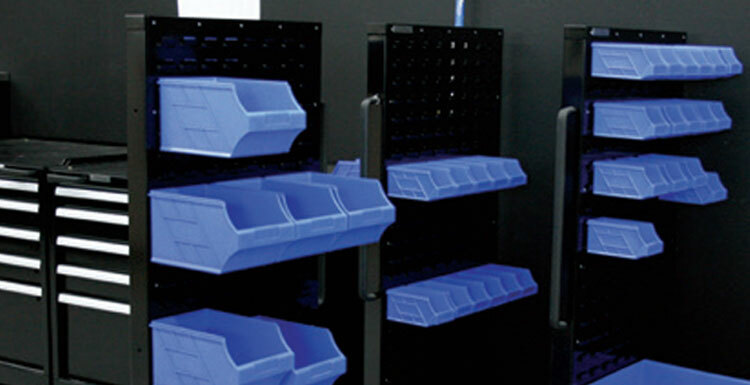 By working with OFS Group advisors and selecting the appropriate drawer heights and partitioning systems, Boscotek High Density Storage Cabinets provided a storage system with minimal space wastage, excellent accessibility and flexibility. Manufactured from 1.2mm steel material and available in a number of flexible configurations the Boscotek industrial storage cabinets provided a versatile solution for HeliMods industrial storage. These heavy duty storage cabinets incorporate multi-point locking, reinforced doors, adjustable levelling feet, heavy duty hinges and 110° door opening for easy accessibility. HeliMods needed to efficiently store an extensive range of small parts and components used in production and assembly. The Boscotek range of linefeed equipment provided a flexible mobile storage solution for HeliMods. Again OFS Group worked with HeliMods to configure the units using a combination of louvre panels and trays to meet their requirements. OFS Group met their client’s needs initially by identifying the versatility that Boscotek solutions could offer. They then worked closely with the client to take full advantage of the options available and designed a bespoke solution to meet HeliMods needs exactly. The refurbished workshop and storage areas offered better use of space, improved accessibility and advanced mobility. 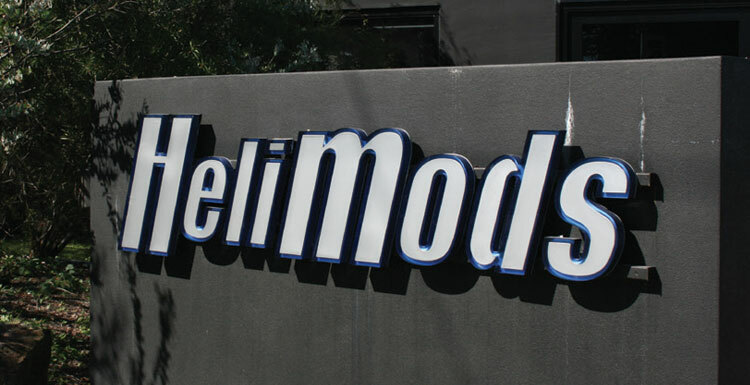 For HeliMods the refurbishment was another important step in supporting their goal of providing high quality solutions in significantly reduced time frames.